The smartphone industry is so expanding and competitive that if you don't compete in the most competitive way, your struggle for survival will start which of course is not good. If you look into the fall of the Finland Phone giant NOKIA we will be able to understand a lot about the competition. They were not ready to mingle and contribute in the change and stuck to Windows and Symbian instead which cost them dearly. Even if you are in the change and you are not competitive enough then you may be staring at a possible defeat. The same thing has happened to Sony too. The almost similar devices have not been going well in the market hence Sony has decided to bring a whole new dimension to their smartphones and bring some phones which can be quite different from the previous generation and also with the new 'X' branding to get the consumer attention to it. In this review, I would like to acquaint you with the phone and also some of the common questions which may arise in your mind. When Sony introduced the Sony Xperia Z it was a huge hit, because it was a whole new thing at that moment which had almost every surprising element to give the user a good change-up when using the phone. But since then Sony has brought Z series phones which too was quite successful but slowly it started to wane because of its repeated design cues and also almost near simple and not so intuitive UI. So bringing a whole new set of smartphones was the need of the hour for Sony or else the situation would have been even worse for the Japanese giant. The last iteration in the Z series was the Z5 series which was not so successful like the original Sony Z series phones. Now, they have released a whole new set of Xperia X series smartphones. Here I am writing about the smartphone; the Xperia X. Let us start with the Design. If you have used a Sony flagship before or at least know about the design architecture you are introduced to a familiar design. Even though there are some basic cosmetic upgrades the basic design architecture remains the same. So people looking for a very big change-up would be disappointed a little. You cannot blame Sony for that because that is their design which got them the success and also their caricature. The new sets of phones too are built the Sony way but there are some minor design changes. The edges are curved and the screen glass is blended seamlessly on the curves and gives a unique design. I would say this design is absolutely a fantastic one and I would say Sony has done a good job; it is not that fulfilling but is a good design. The only thing I don't like is the awkward positioning of the volume rockers which I think is literally not good for everyday use. The typical Sony power button which also has the fingerprint scanner embedded in it is situated to the right, so are the volume rocker and the dedicated camera button. On the left hand side you have the SIM tray, at the top you have the 3.5mm headphone jack, and at the bottom you have the micro USB port. At the front the phone sports a 5 inch IPS LCD full HD display with a pixel density of 441 PPI. So for me being a former Sony fan and now seeing a good usable design from Sony is a welcome move. If any of you have used the previous Xperia devices, you may know that holding the phone was really not a good thing; the glass panel on the back was also slippery. With this new design Sony has improved a little bit with metal back and curved edges. As I stated earlier the phone sports a 5 inch 1920 X 1080 IPS LCD display reproducing a pixel density of 441 PPI. The screen is excellent and has good colour reproduction, but one thing I really don't like is the core temperature because it is too high resulting in bluish whites which is not surprising on a Sony screen. Almost all Sony screens have that problem, I don't know why Sony isn't fixing the problem. On a positive note, the gamma is excellent and both minimum and maximum brightness is spot on. The User Interface is polished and a little different from the earlier Sony devices. For example, the icons in the settings panel or in the menus are designed to have a different feel altogether. I can't say if it is an improvement from the previous IU but is not bad either. One important feature which Sony has added is the search feature, where you can search for any app on the device by just simply swiping down anywhere on the home screen which I think is pretty handy. The overall look of the UI is good and is typically designed the Sony way. The custom UI of Sony works pretty well on this device. The minor tweaks give a good look to the overall UI. The Xperia X is run by the Snapdragon 650 SOC Hexa-core CPU clocking at 1.8 GHZ with a generous 3 GB RAM and an Adreno 510 GPU. These specs translate into performance and the latest Android Marshmallow runs excellently on the device. Serious gaming too can be done thanks to the Adreno 510 GPU. There is no lag or stutter anywhere in the UI, but I cannot guarantee you a stutter free life on your device because it is an Android device. Any Android device will have minor stutters, jitters and Jerks. But when I used the phone I didn't experience any lag or stutter. Maybe it will in the future. The generous 3 GB RAM helps in managing the overall performance of the device. The phone is responsive and quick. I would say Sony has done a good job here. But I can't understand the reason of Sony opting for 650 CPU instead of the 820. Nevertheless, it does its work and is a good responsive Phone. The phone is sold as both the 32GB variant as well as the 64 GB variant. You can go for whichever you prefer depending on your budget. If you are a moderate user then the 32 GB variant could be more than enough for you. If you are a power user like me what you can do is buy the 64 GB variant and expand it through a micro SD card. So storage is sufficient and is also is not a case of worry. 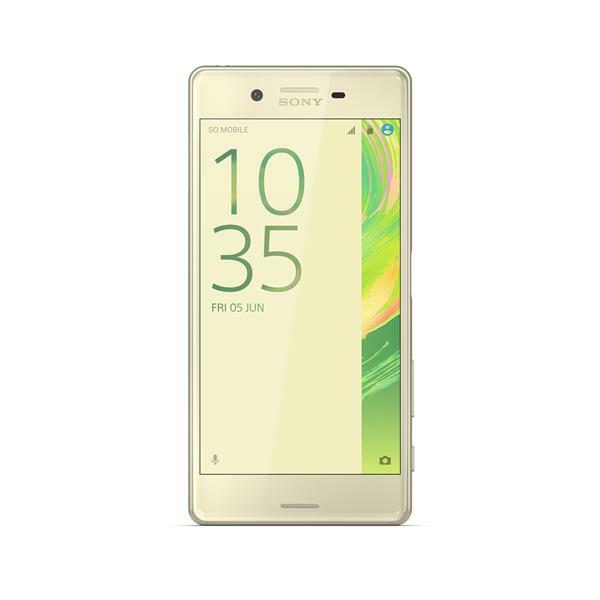 The Sony Xperia X has a 23 MP rear camera with the Exmor RS sensor with an aspect ratio of 4:3 and a generous 13 MP front-facing camera. Now Sony has been hovering around the 20 MP range for a quite some time now but has not been able to translate it into camera performance. I would say the camera is good, but not that great considering Sony's reputation in mind and also the MP range. The new Hybrid Auto-focus does a good job of focusing pretty quickly but Sony's claim to focus in just under a second I think is an exaggeration. The details seem to be washed out on the sides of the image although the centre is quite detailed. There is a possibility of a noisy image every time. Under low lights and under the Sony flash the things get even worse. Bright lights are not handled properly and there is a lot of noise in the picture. The interface is pretty minimalistic like in the Z5 and getting into the camera app is pretty simple by pressing the two-stage camera button or double clicking the power button. The camera also has some intuitive features like Face-in-picture. The Sony Xperia X has 2620 MAH battery and Sony claims almost 2 days of battery life. This is one of the things I love about Sony. It has a very good Power Management system which helps in managing battery life. In reality lasting the battery for 2 days is not an impossible thing if you are a pretty moderate user, but for a person like me would get around just a little more than 1 day of usage. The 32 GB variant is priced approximately at Rs. 44900. I would say this is just a little over priced and the competition is so tough that surviving in this category would be very difficult for Sony if they don't bring down the price soon. There are some other phones in the same price bracket which are relatively superior, like the Samsung Galaxy Note 5. This is not a good proportion and I personally think this is a bit overpriced. Good design, Sony custom UI a little bit polished, good battery life, good snappy performance, pretty quick focus, generous expandable storage. Still slippery back, pretty average camera, colour temperature not accurate, a bit overpriced.